Like most other nations in Asia, Vietnamese people welcome the New Year according to the lunar calendar, and Tet Nguyen Dan (the lunar New Year Day) has long become the biggest festival of the nation. 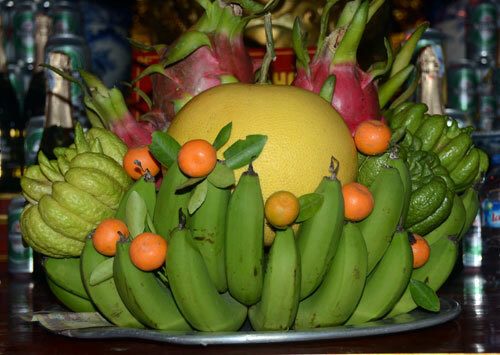 Among the numerous offerings that are required to decorate ancestral altars during the traditional New Year, a five-fruit tray is indispensable for each Vietnamese family, which is a symbol of the wholeheartedness and filial piety of the present generation towards their ancestors and the Genie of the Land. Like other popular rituals, the preparation of a five‑fruit tray for Tet has become an established convention. During the few days just before Tet, the Vietnamese begin to buy the necessary fruits for this purpose. A five‑fruit tray is usually composed of a hand of green bananas, a ripe pomelo (or a Buddha’s hand, a shaddock), oranges, persimmons, sapodilla plums, a bunch of kumquat, and in recent years, one can add mangoes and grapes from southern Vietnam, or apples and pears from China. Although it is called a five‑fruit tray, it does not necessarily contain exactly five kinds of fruit. Arranging fruits on the crimson, hourglass‑shaped wooden tray is really an art. One has to combine the colours and shapes of the different fruits in arranging them on the tray to make it look like a still life picture. To ensure balance on the tray, the hand of bananas is usually put in the middle with the bananas pointing upright and the pomelo on the concave surface of the hand of bananas. Then the oranges, sapodilla plums, apples are added in the gaps between the bananas and the pomelo. The last little gaps are filled in with little kumquats to create a full, compact tray of fruits. In colours, the fruit‑tray presents a harmonious combination of the different colours of fruits: dark green of banana, light yellow of pomelo, deep red of persimmon, reddish yellow of orange and kumquat, light green of apple, and dark brown of sapodilla plum. To complete the picture, the fruit tray will be covered here and there with some small, fresh leaves of kumquat. The five-fruit tray, together with horizontal lacquered boards engraved with Chinese characters, parallel sentences written on red paper, ornamental kumquat and peach trees, and popular Hang Trong and Dong Ho pictures, has transcended its material value to become a spiritual symbol, an original national product in the spiritual life of the Vietnamese. At present, while many of the ancient spiritual values have sunk into oblivion, the custom of arranging the five‑fruit tray on the altar during the lunar New Year days is being jealously preserved as a fine legacy of Vietnam’s traditional culture./.